February is right around the corner and that means Valentine's Day! More importantly, that means CANDY! 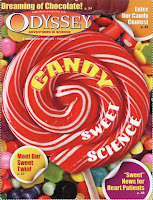 Fittingly, the February issue of Odyssey magazine is all about Candy! 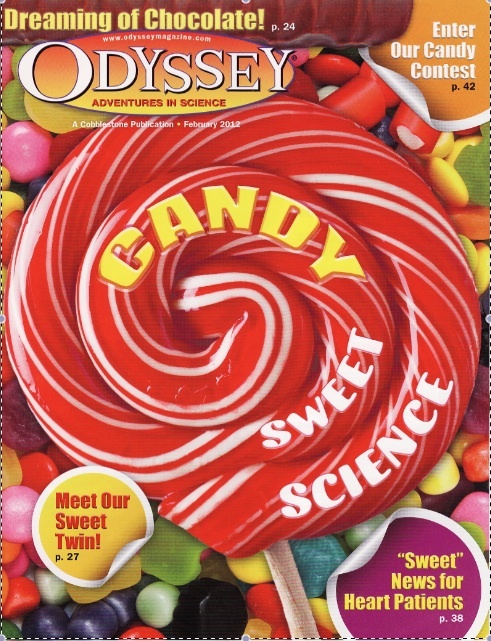 To complement my article, Odyssey has a Candy Concoction Contest. Entries must be postmarked by March 30, 2012, so check it out. And, four pages after my article, check out a piece by fellow INK member, Karen Romano Young. Her Humanimal Doodle is titled "Honey Doodle". 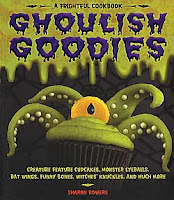 Librarians, teachers, and parents, looking for other books about Candy and Sweets for February? In May 2011, I wrote Sweet! 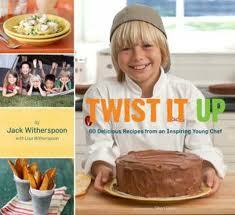 Interesting Nonfiction for Kids with a list of book suggestions. This week three of our INK authors, Steve Sheinkin, Sue Macy, and Rosalyn Schanzer, received high honors from ALA. Recently, Vicki Cobb was informed she’s being given a Lifetime Achievement Award by AAAS/Subaru/SB&F. So we’re a-celebratin’ in the virtual INK house. It seems like a good time to hear what it’s like to receive one of these scrumptious award calls. “This book was sort of like a baby to me (except it took a lot longer to make) so it feels great to see him out in the world doing well,” says Sheinkin. Some of our honorees received their honor earlier. 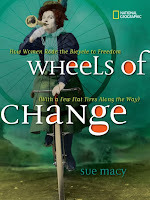 Sue Macy is the author of Wheels of Change: How Women Rode the Bicycle to Freedom (With a Few Flat Tires Along the Way). She says, “My book was named among the five finalists for the YALSA Excellence in Young Adult Nonfiction in early December, and the winner (Steve) was announced yesterday at ALA. So my moment of excitement came back at the beginning, via an e-mail from my editor, Jennifer Emmett. I was thrilled to be in such fine company as Steve, Karen Blumenthal, Susan Goldman Rubin, and Marc Aronson and Marina Budhos. It was definitely a high point in my career.” She attended the awards ceremony in Dallas and spoke there. However they were informed, these INK folk have plenty of reason to go out and celebrate. (I hope their editors/marketers/agents are dancing, too.) Of course, the committee members, who read so many books over the course of a year, should receive big thanks from the nonfiction community, as well. Because of their passion for literature, these committee members applied their time and discerning minds to help point out and elevate excellent work. We’re all looking forward to see what other books Roz, Steve, Sue, and Vicki cook up in the coming years. CONGRATULATIONS to INKsters Roz Schanzer, Steve Sheinkin, and Sue Macy whose birthdays came early this year! Every January brings a second birthday to a chosen few children's authors – with perhaps the best presents ever. That's when ALA announces the Oscars of our profession. Monday was that day. • Caldicott honor for Patrick O’Donnell’s Me…Jane, a picture book biography of Jane Goodall. We scored big time in the Coretta Scott King awards. • Kadir Nelson’s Heart and Soul: The Story of America and African Americans won the gold medal for text and a silver for illustration. • Patricia McKissack and Leo and Diane Dillon for Never Forgotten. This is an original folktale told in verse and I’m going to claim it for nonfiction, just because I want to! • Balloons Over Broadway: The True Story of the Puppeteer of Macy’s Parade by author/illustrator Melissa Sweet. The silver honor awards went to…..
• Witches! The Absolutely True Tale of Disaster in Salem, a middle grade illustrated book by our own inimitable Rosalyn Schanzer. • The 2012 Excellence winner is Steve Sheinkin, erstwhile INK blogger, for The Notorious Benedict Arnold: A True Story of Adventure, Heroism, and Treachery. • Karen Blumenthal and Bootleg: Murder, Moonshine, and the Lawless Years of Prohibition. • Susan Goldman Rubin and Music Was It: Young Leonard Bernstein. Award-winners covered American history (both white and African American,) world history, women’s history, and music. Judges leaned toward biography this year, with science getting rather short shrift. I wonder why. Nevertheless we’ve got some fabulous books to teach from and enjoy. Congratulations to all the winners – and to their editors, book designers, and illustrators! I’ve heard writers question the value of providing teacher guides for their books. Those who have tackled writing one themselves have likened it to writing those old books reports we were forced to produce back in the day. Other writers hire professionals to write their guides for them, almost always having to pay for them out of their own pocket. Still others have been known to accept whatever the publisher is willing to provide, without any power to change them. I’ve never contemplated the value for the writer to provide a guide until recently when I’ve found myself searching or guides to help me prepare my lesson plans. Now I ‘d like to voice my opinion on these guides—yes, yes, yes! After a few weeks of cursory internet searching, it’s clear to me that not all teacher guides are created equal. Those on the publisher’s sites tend to be the worst, meaning less expansive, including only a few questions on the specific book and none on the topic as a whole. From what I’ve seen so far, those who hire “professionals” to write for them are of a mixed bag—some excellent, some sounding like they copy and pasted questions from previous curriculum guides. But, boy oh boy, some of these things are really well done. I’ve found some gems that are well written, well thought out, and, I might even say, thought provoking. One particular favorite was a full18 pages long and had it’s own table of contents! It talked about how this particular book could be used successfully in ever subject matter from science to art, it provided projects to do in an hour and those to pursue if you had time over a few weeks. I immediately noted down several books suggested to read to accompany their book and headed to the library to check them out. I don’t know if this kind of guide sells books but it definitely provides a potential reader/ teacher with a reason to choose to read it with their students. It can be quite a challenge to know which book to choose to discuss a broad topic when you only have time to read one book. The well written guides offer ideas on the directions a teacher can go in and, when so many of the options are intriguing, it makes it an easy decision to choose that particular book. The more I think about it, the more these guides might be the first place to start for one’s own writing. Visualizing how your book might be used by a teacher, what themes could be picked out and what activities could grow out of the ideas the book focuses on. Writing with these ideas in mind, perhaps the final product will have that magic marketing appeal that all publishers are looking for. This could work if we don’t spend a lot of time fussing over the guide as a procrastination tool to writing the manuscript. On second thought, I’d better stick with reading them rather than writing them for now. You’d better use your extra second while you can, because it might just disappear. I’m talking about the leap second. Leap seconds are a little like leap years but shorter. A lot shorter. (Actually, a “leap year” really should be called a “leap day,” IMHO.) And they are an endangered species. It’ll take me just a few leap seconds to explain. Once upon a time, time itself was measured by the rotation of the earth. There are 24 hours in a complete rotation (aka one day), 60 minutes in an hour and 60 seconds in a minute, so a little arithmetic tells you there are 24 X 60 X 60 = 86,400 seconds in a day. You could set your clock by it. Actually, your clock was made to show it. This was all fine and well and if anyone was late for church on his wedding day, he really couldn’t blame the clock. 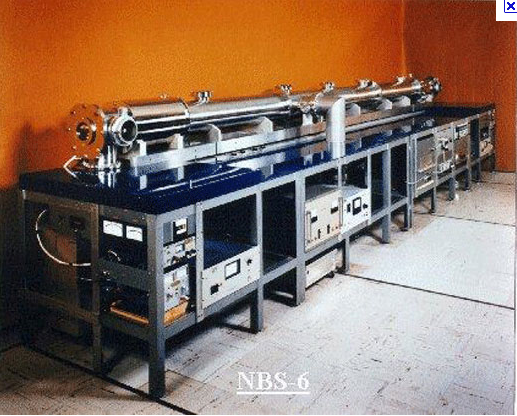 But scientists weren’t satisfied because it was hard to be sure of the precise duration of a second, so in 1967 they put official timekeeping in the hands of the hand-less atomic clock. An atomic clock relies on the oscillation frequency of a certain type of atom known as cesium-133. Atomic clocks may be cumbersome on your nightstand, but they sure are accurate. After 100 million years, give or take, an atomic clock will be off by one second. In the techno-world beginning to emerge in the 1960’s, precision in timekeeping was of great importance. Imagine how grumpy networked computers might get if different parts of the network were off by a second here, a second there. Atomic clocks solved that problem, and traditionalists couldn’t complain because the atomic clocks were pegged to the earth’s rotation. A“day” on an atomic clock and a “day” defined as a single rotation of the earth were the same. All was well in timekeeping. Eventually, something was found to be rotten in Denmark and everywhere else on the planet: the Earth does not run like clockwork. Its rotation is gradually slowing down. Rather than losing a second in 100 million years, it loses a second every few years. In an average human lifetime, the earth might lose 15 or 20 seconds. (Think of what that poor average human could have accomplished with an extra time.) So to keep the world’s atomic clocks in sync with the actual earth, the leap second was born. Because the rate of slow-down is not perfectly predictable, the insertion of a leap second is not on a regular schedule like leap years, which synchronize our calendar’s annual cycle with the earth’s revolution around the Sun by inserting February 29th every four years (with some carefully worked out exceptions). The International Telecommunications Union, an agency of the United Nations, announces leap seconds on an as-needed basis. The last one was in 2008 and there will be another on the night of June 30th of this year. The extra second will be added before July 1st rolls around. Start planning this gift of time before the summer rush. So what, if anything, does this have to do with children’s books? For one thing, I am not aware of any book on the leap second or even a book on time that mentions it. (OK, commenters — tell me about all the books I missed.) More importantly, I have confession: In all of my non-fiction science and math books I have simplified some concepts to make them age-appropriate for what I see as the book’s readership. Or I have left them out altogether if I thought an adequate explanation would be too long, too difficult or too uninteresting. This is a judgment call, of course. Sometimes I have regretted my judgment. There are millions of things you can measure, and time is one of them but in Millions to Measure I did not include the measurement of time. This is probably because I had an axe to grind about the archaic system of measurement still used in the United States. I wanted to concentrate on showing how the metric system works and how much more sensible it is than our uncoordinated system of feet, pounds and fluid ounces. (In fairness, I should disclose that we aren’t the only country using this system. Last I checked, it was also the norm in Liberia and Myanmar.) So in a book comparing metric (technically known as Système International, or SI) units with “customary” (American) units, there was no need to talk about time because — guess what — time is measured the same way in all nations. Amazing but true: everyone uses the same years, days, hours, minutes and seconds! But now that there’s a brouhaha brewing over the leap second, I wish my book had prepared users to understand it. I wish I had included cesium clocks because they are kinda cool (and wouldn’t kids think so, too?). I imagine all authors of non-fiction for young readers must decide whether content is “too hard” or “not too hard”? It might be an interesting panel discussion subject: how do you decide? Do you just have a hunch or do you use guidelines of some kind? Is there such a thing as “too hard” at all? Can any subject be made accessible in the hands of a master? While you’re pondering that, I’m going to think about what I’ll do with my leap second on June 30th because it may be my last. I hope I’m not being too repetitive, but I’m nothing if not consistent. Since books keep appearing that blur the lines between fiction and nonfiction, and people keep asking whether or not that’s acceptable; I keep feeling compelled to pipe up with an answer. If pushed to choose Yes or No, my answer is No. But a Yes or No answer simply won’t suffice in this ever-stretching conversation. So I continue to redefine what is acceptable to me as I think about it. I wrote about this issue for the Horn Book in an article called A Fine, Fine Line (a reference to Avenue Q, which I admit, probably means I need to find a 12-step program for Musical Theatre Lovers Anonymous), and in a New York Times review of a biography that muddied the waters to the extent of inventing a narrator who engaged in fictional dialogue with the real-life subject. Here is my consistent line in the sand (not that anyone should care what I think!). If an author and/or publisher fictionalize parts of a book, but take the time and care to ensure that readers are made aware of which bits are fiction and which bits are true, I don’t worry as much for the reader. But if the team does not do this, I find it misleading and unfair in terms of our responsibility to our young readers. I have no beef with engaging books, dynamic packaging, and trying to keep things interesting for kids, especially while so much of their non-book media world is so dazzling and shiny and potentially distracting. But when the entertainment factor starts to get in the way of their knowledge base being filled with half-truths, I believe the line has been crossed. Now, you may have noticed that I am not citing any specific books to scrutinize even though I referenced ongoing conversations about new titles in my second sentence. That is intentional, as I’m starting to think this is less about particular books and more about a growing lack of attention to what, in my humble opinion, has the potential to create a problem for young readers. It’s not a new problem; it is more of a revisited phenomenon that had fallen out of favor and is being embraced once again, as evidenced by a recently published book that has the words “fact and fiction” in the subtitle. So clearly, this blending is being done with some planning and thought. These decisions are intentional, and being made by plenty of smart people in our field, so I welcome any and all opinions—especially those that might shed some light on an aspect I perhaps have not yet considered. Forget resolutions, let's talk accomplishments! One part of the conversation that caught my ear was the idea of listing your accomplishments from the previous year as Julie did in this post, 2010 Anti-Resolution Revolution, instead of thinking about negative things you want to "fix." Sounds like a good idea to me! Things always go in a different direction than I had originally intended, how about you? Finished a picture book that's coming out this spring, Seeing Symmetry. Enlarged some teensy cowboy boot art from the book and made it a coloring page that about 500 people have downloaded already. 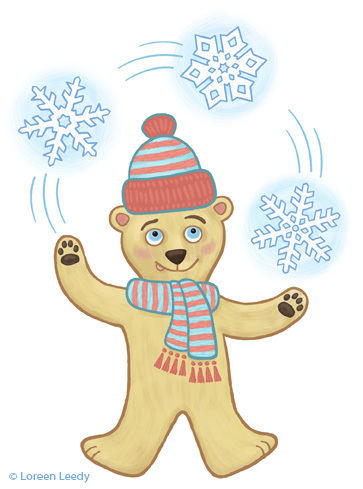 Sold a picture book that I'm working on now. Tweeted quite a bit, am up to almost 700 followers on Twitter. Redesigned my out-of-print sea turtle book, Tracks in the Sand, and put it on the iBookstore (free sample here). Bought an iPad 2, got quite a few apps, started reading ebooks mostly. Spoke about picture book apps at the Florida SCBWI conference in June. Scribbled down way more ideas than I could ever make happen, even if I live to be 110. Not to go on and on but that's the idea. For many of us, it's all too easy to focus on what we didn't do, couldn't finish, utterly failed at, while ignoring what we did get done. So take a few minutes before January is over to remember what you did in 2011…and ponder what your list of accomplishments might look like 12 months from now. I'm been thinking lately a lot about FOCUS. It's my New Year's Resolution. I try to come up with one word that says it all to me. One word because then maybe, just maybe, I'll remember what it is. Once in a while it's a phrase. But it has to speak to me and usually somewhere around December 30 it just comes. Last year it was ENJOY (as in, life can bring you hard times, so you really should enjoy the good ones!). The year before it was INTENTION (as in, be truly present for every moment). Each year I don't give up the one from the year before because, theoretically, anyway, I should have figured out over the course of the year how to follow that resolution, and so each year I'm adding on to the ones from the years before. This is the goal, anyway. So this year's resolution and goal is FOCUS. As in--keep your eye, your heart, your mind on what you have set out to do. Be a bird charting your own course, not a bird who is buffeted this way and that by this breeze, or that change in the wind. Sometimes when I say it to myself I add Hocus Pocus. Focus Hocus Pocus. Because it sure is going to take some real kind of magic to focus, isn't it?! That's my arm, by the way. It's a temporary tattoo my friend Rebecca gave me because she knows my resolution. She gave me two. I might have to order some more. Because this is going to take a lot of reminding, and some real Intention. I have a huge nonfiction book to research and write, another one to finish, and a novel that is calling me and demanding I pay attention to it (and I want to!). I have a new book coming out in August, which will mean a lot of external input threatening my focus. Before that I have to update my web site. And then there's life. As I write this I know that every single person who is reading this feels the same way. The particulars may be different, but the problems (and I imagine the occasional moments of panic) are the same. I'm writing this on Friday morning, and was inspired to write it right now because of an article I read in the New York Times. Did you see it? The story about a cell phone disrupting the last, beautiful, very quiet measures of Mahler's Symphony No. 9? There are a few things that I like about this story. One is that the conductor, Alan Gilbert, stopped the performance. That sound was disrupting his focus, the focus of his musicians, and, of course, the focus of the audience. We were in London in 2005 at a performance of The History Boys, and the same thing happened. Front row. Awful noise. A crucial scene. Third time. One of the actors, Richard Griffiths (a large and scary man at this particular moment), furiously stopped the scene and said, "I can't compete with these electronic devices." He ordered the man to leave and we all applauded. He then started the scene again, he said, for the second and last time. It was a memorable play and a memorable experience. I imagine the Mahler the other night was, too. I don't think Mr. Gilbert yelled, but he did stop the performance and ask that the phone be turned off. He respected the need for focus, and for the purity of art. According to the article the man whose phone it was felt just awful and didn't sleep for two nights. Venom was spewed at him all over the internet. According to the Times he was a 20-year subscriber to the New York Philharmonic, and has often been irked by noises in Avery Fisher hall--coughs, people who clap at the wrong time, and cell phones. "It was just awful to have any role in something...so disturbing and disrespectful," he told the Times. When someone from the Philharmonic called him the next day (having figured out who he was) and asked him politely not to do it again, he agreed, of course, and asked if he could apologize to Mr. Gilbert. They talked by phone and the conductor said to him, "I'm really sorry you had to go through this" and accepted his apology. Don't you love it? But what I also love is what Patron X (as he is called) said. He said that this underscored (pun intended?) "the very enduring and important bond between the audience and the performers. If it's disturbed in any significant way, it just shows how precious the whole union is." So I read that this morning and I thought--same here. If we let cell phones and other "electronic devices" get between us and our focus on our art--whether we are writing, reading, researching, or teaching, then we are violating a sacred bond. "The function of education is to teach one to think intensively and to think critically. Intelligence plus character – that is the goal of true education." Dr. Martin Luther King, Jr. , who might have been celebrating his 83rd birthday with his children and grandchildren. He might well have taken time from the festivities to accept an invitation to one or another of the Sunday morning TV talkfests this past weekend to talk about the candidates and the issues faced in the upcoming primary in South Carolina. Would that we could've seen the old warrior, note the whiteness of his hair, how four score and three years were reflected in his face, and heard what scorching words he'd have chosen to say about them and the state of the nation. Would've But no. "The mountain gorilla faces grave danger of extinction, primarily because of the encroachments of native man upon its habitat – and neglect by civilized man, who does not conscientiously protect even the limited areas now allotted for the gorilla's survival." Dian Fossey, a.k.a. Nyiramachabelli (Her nickname, given to her by her native Rwandan neighbors, means "the woman who lives alone on the mountain. "), from her article, Making Friends With Mountain Gorillas, National Geographic, published in January 1970, back when I was a college dork and Richard Nixon was in office. (Doesn't it just knock you out that that wily old politician would have turned 99 just the other day? It does me.) In a kinder, gentler world, the old warrior woman would have been celebrating her 80th birthday today, but no. Our world is not without gentility and kindness, but because we are capable of self-interested, cruel, and nasty impulses, Dr. King and Dr. Fossey are not among us, the living, today, because they were murdered by their fellow humans. Because they are well worth knowing, many a handsome book has been written about them, their works, and their valiant lives, cruelly cut short. 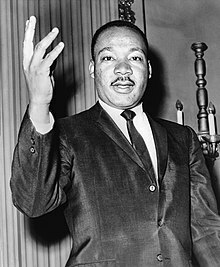 Meet Martin Luther King, a Landmark book by James T. de Kay. A Picture Book of Martin Luther King, Jr. , by David Adler. Doreen Rappaport's life of Dr. MLK, Martin's Big Words, illustrated by Bryan Collier. My Uncle Martin's Big Heart and My Uncle Martin's Words for America: Martin Luther King Jr.'s Niece Tells How He Made a Difference, both written by Dr. Angela Ferris Watkins, well-illustrated by Eric Velasquez. AND – if I hadn't been writing this blogpost today, I might never have known about this beautiful book. Gee whiz Cheryl, wake up & smell the coffee, why doncha – My Brother Martin: A Sister Remembers Growing Up with the Rev. Dr. Martin Luther King Jr., by Christine King Farris, with handsome illustrations by that smartypants genius Chris Soenpiet. As to books about Dian Fossey, do check out the Nat'l Geographic's completely gorgeous photobiography, Light Shining Through the Mist. There is Heidi Moore's book, too, in Raintree's "Great Naturalists" series, and, of course, absolutely, turn to Gorillas in the Mist. Dr. Fossey's own book begins with these words: "I spent many years longing to go to Africa..."
Ah well. Thence to heaven. Once a long time ago, Martin and Dian were winter babies, brand new and unaware. Read about them today, tell about them today, lest they be forgotten in this mean old world. 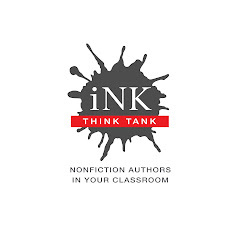 A few days ago, Vicki wrote about the success of the first videoconference between an iNK Authors on Call author and students in Bogert School in New Jersey. I happened to be the author in that interaction, but I believe that all of us will have similar successes connecting with the students. Before each of us skypes with them, the students will be familiar with some of our work, and just the idea of having a “real author” interested in them is an exciting prospect. Real people write those books—wow! The enthusiasm of Bogert's devoted teachers also rubs off on the students, and the special projects they will undertake give them a change from routine classroom work. All the elements area there for a successful project. A key element in what we’re doing that makes our interactions different from a traditional school visit is that we skype with the teachers first and find out what they would like to see in the students as a result of “meeting” their author. Different teachers can have very different goals. For example, Jason and Chris, “my” teachers, hoped that I could help their students to connect with their own real worlds, with their day to day environments, and to become curious about them and begin to ask “why” questions. As a 20th century kind of person, I tend to attribute the students’ disconnect with what I would call the “real world” to their incessant contact with input from outside worlds—music from their ipods, text messages on their cell phones, comments on their Face Book pages, and so on. These sources of “information” have little or nothing to do with the environment through which the students are moving on a day to day basis. As a result, when a teacher asks the students what in their lives sparks their curiosity, what around them might they want to learn more about, they have no answer. They are so wrapped up in those outside worlds that they are disconnected from the actual world in which they eat, sleep, and go to school. So, when I talked to the students, I suggested they take a look around as they go home from school and start to wonder—why do some trees loose their leaves in the fall and others don’t? Where do the ants go when they disappear into a crack in the sidewalk? That sort of thing. From what Jason and Chris have indicated, some of the students are awakening to their environments, and the classes as a whole got truly engaged in our interaction. From five time zones away (I was in Hawaii), I could feel their enthusiasm as they murmured to one another while watching my slide show. As for me, this experience is only strengthening my knowledge that the two things in life that most help me “come to life” are learning new things and communicating the excitement of learning to others. I think that’s a powerful motivating force for all of us who have chosen to write nonfiction books for children, and connecting directly with our readers, even from far away, gives us a special high we can’t get in any other way. It's a win-win process. Last month, I answered the question, “Where do you get your ideas?”—for one book, anyway: Those Rebels, John and Tom. Having grown up spending so much time with the characters of the Broadway musical “1776”, it’s not surprising I’d one day want to write my version of Adams and Jefferson. But a picture book needs a tight focus, and so, early on into writing the book, I had to decide where to shine the spotlight on these two, remarkable figures. 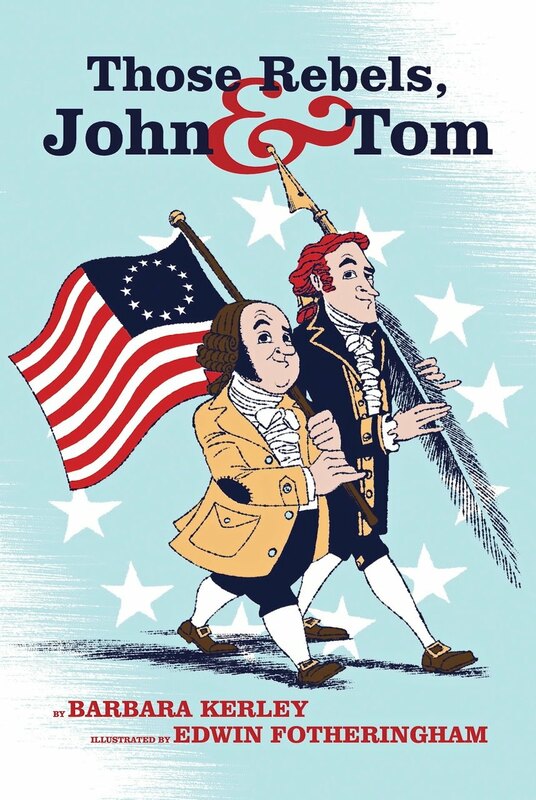 My goal for Those Rebels, John and Tom was to give an inkling of who these two men were, how they worked together, and how much their partnership benefitted the country. Writing about a famous person can be tricky, as they often have a kind of mythology tied to their fame. Those Rebels, John and Tom has not one but two famous people, stuffed into the same book. Talk about mythology! Jefferson is carved in stone on Mt. Rushmore—you don’t really get any bigger than that. How does a biographer do this? Secondary sources are invaluable to paint an overall picture and provide a cultural and historical perspective. But my favorite source of information is primary sources—what I think of as ‘eyewitness accounts.’ That’s where all the juicy details come from. And it was in primary sources that I found details to help uncover just who these men were. Primary sources showed me that the champion of democracy had a real sweet tooth. The author of the Declaration of Independence, I discovered, was a bit of a clotheshorse. Biographies are built upon the whipped syllabubs and ten-shilling hats which take men and women off the pedestal (out of the portrait, off the face of Mt. Rushmore) and place them squarely before us, not to be admired as mythological figures, but to be understood as the extraordinary and yet all-too-human people they were. One thing that struck me early on in the research process was how very very different John and Tom were. And there’s no easier way to see that than by comparing their homes. Jefferson was born into Virginia aristocracy—and his house, Monticello, reflects that. Monticello is beautiful—and if you have never been, I recommend you go sometime. But it was not in any sense a practical house. Most wealthy people in Virginia built their mansions alongside a river, if they could. It made transportation issues simple as you could just float supplies to your doorstep. Alternately, they built their mansions on a road—again, simplifying the transportation of building supplies. Tom did neither. He erected his mansion on top of a little mountain. He had to have roads cut through dense forest to haul the supplies up and up and up. When the building process started, there wasn’t even enough water onsite to mix the clay to form the bricks—it had to be hauled in from a stream. Tom drew up the plans for Monticello himself, basing the design on a villa with grand stone columns. In fact, he was intimately involved in all aspects of the design and construction. And when I say “intimately involved” I mean just that—I mean intimately, meticulously, some might say obsessively involved. Tom designed everything from the placement of those stone columns on the portico down to the size of the individual bricks, measuring and calculating, sometimes down to the ten thousandths of an inch. 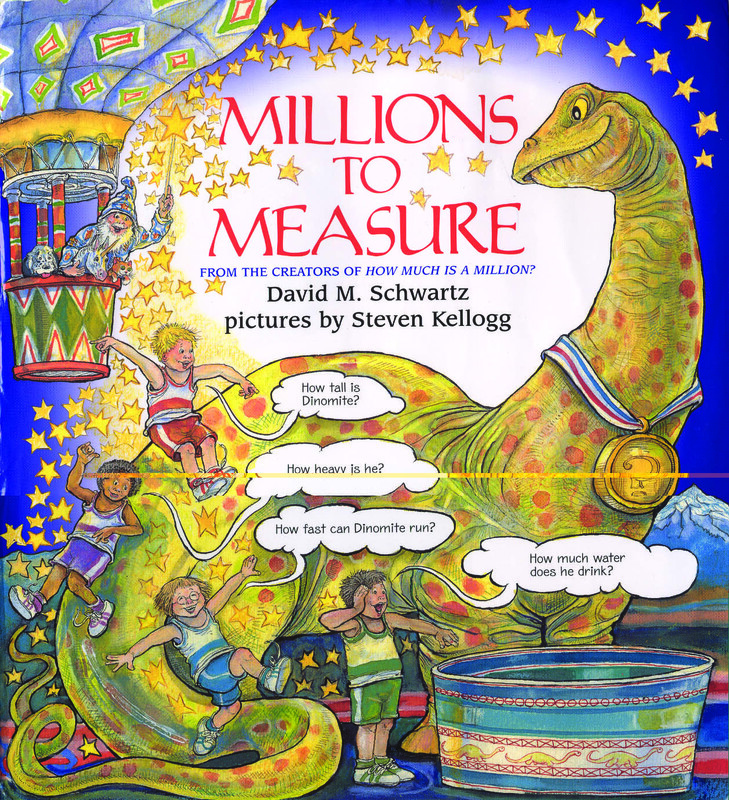 One of his calculations was a measurement for 1.89916 inches. This, in an era where bricks were made by hand—filling wooden forms with clay, letting the bricks dry, and then firing them in brick kilns built onsite. Tom liked to oversee the bricklayers’ and carpenters’ work closely, and I can only imagine some of the comments they must have made when he was out of earshot. Monticello became a life-long obsession with Tom. He began working on the project in 1768 and was still working on it 40 years later—with additions, demolitions, and renovations in between. The bulk of this work—the building and rebuilding—was done by his many slaves. Jefferson himself did not do manual labor. Contrast all that to John, the son of a shoemaker. He pruned his own fruit trees, cut his own hay, carted manure out to his fields, and split his own firewood. On occasion, he hired men to help him with the big jobs: building stone walls, digging up stumps, and plowing the fields to plant corn and potatoes. When John inherited his modest, 100-year-old wooden home, he built a small addition onto the back—just a lean-to of a couple rooms—and then called it good. He and Abigail lived there for the next 27 years. John and Tom were certainly compelling characters to write about. And next month, in the third and final segment of this FoundingFathersPalooza, I’ll talk about the themes that brought these two very different men together—and drive the narrative. Tanya Lee Stone. Susan Goodman. Jim Murphy. Kelly Fineman. You know these folks. They’re regular contributors to this blog. They’re also four of the thirty or so authors featured in Real Revision by award-winning children’s book author Kate Messner. 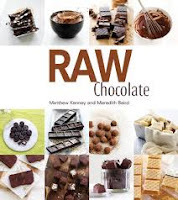 The book is such a gem that you’ll definitely want your very own copy. 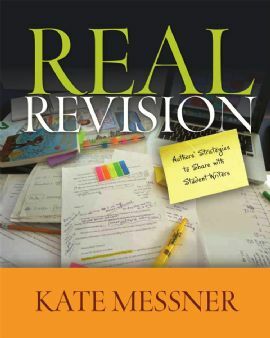 Real Revision is published by Stenhouse Publisher, which caters to educators, so this book is written specifically for teachers. That makes it great for all you educators out there. But I know plenty of writers also read this blog. This book is a MUST READ for you, too. Some chapters focus on fiction-specific revision strategies, but the lion share of the book is useful to nonfiction writers as well. Here are few of my favorite quotations from nonfiction writers. Jim Murphy on finding the proper voice and storytelling technique for his Newbery Honor book The Great Fire. And these great bits or advice are just the tip of the iceberg. Trust me. This is a book you won’t want to miss. Happy New Year everyone. 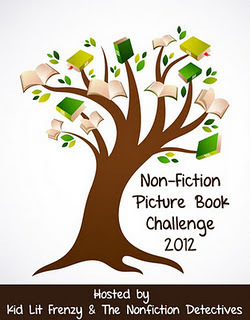 I'm not one for resolutions (or keeping them), but this year I've decided to take the 2012 Nonfiction Picture Book reading challenge. Founded by Alyson Beecher of Kit Lit Frenzy and co-hosted by The Nonfiction Detectives, this challenge is to get more people reading and talking about kids nonfiction picture books. What could be bad about that? Various bloggers and people with GoodReads shelves can read and review nonfiction books. If they sign up with Kit Lit Frenzy or The Nonfiction Detectives, those reviews will also be published once a week throughout the year. It's a way to get the word out about a lot of great books. And a place to find out about a lot of great books. So once a month when I post, I will also include a short review of a book. Part of my personal challenge is that I'm going to try to alert people to some of the new books coming out in 2012. 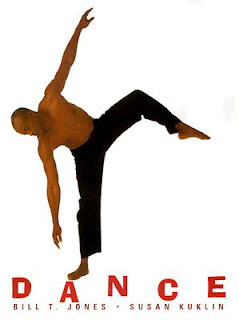 Since it's January 9th and I haven't had a change to find any 2012 candidates, I'm going to recommend a book that I think is timeless--Dance by Bill T. Jones and photographed by our own I.N.K. colleague Susan Kuklin. 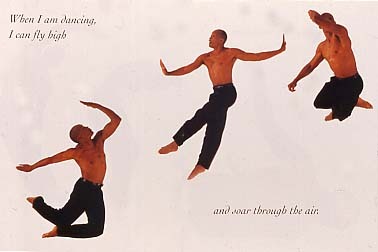 In Dance, Kuklin photographed Jones against white backdrop so he is all we see as he stretches, curls, leaps and floats through the air. His expressive body and a spare lyric text celebrate the joy of movement. and I am hardly there. and I am only one. This book gives children the words to describe and understand how they feel when they move. What a gift. Stupidly, shamefully, this book is out of print. I can only hope Jones and Kuklin got the rights back. And that you can find it in your library.